Happy August long weekend! It’s not over yet, so i hope that today is a day of relaxation and fun for you all. Summer + long weekends= rock on! This weekend has been gloriously beautiful and we were able to take full advantage of it… Lexi’s beach volleyball took us to Spanish Banks for provincials Sat and Sun. We decided to make it a mini vacay and stayed overnight. So fun! And we got to business by checking off two summer bucket list items…fist pump! First one? 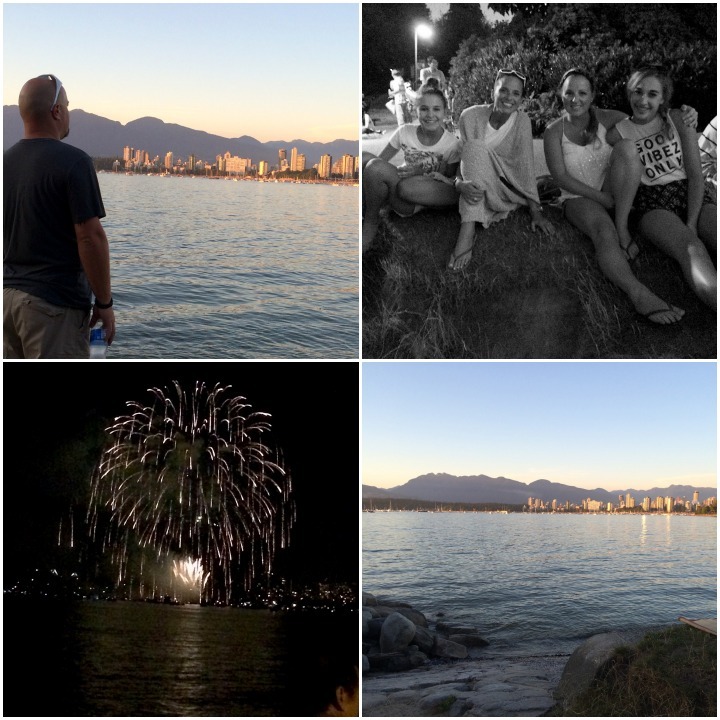 Taking in the Celebration of Light firework show. If you can believe, having lived here my entire life, i had yet to ever go to the fireworks. After Saturday night, i’m wondering exactly why it’s taken me 40 years to get there…i’m a total sucker for these light shows aloft! They were spectacular and i found myself getting a wee bit emotional at the beauty of it. Glittering balls of fire shimmering off the high rises of downtown, the lights of the surrounding ski mountains and the Lions Gate Bridge, a crystal clear and warm night ..all at once…even topped off with some shooting stars during the show! I took this all in and just felt incredibly grateful that we can live in such a beautiful city. Definitely a huge highlight for me. Saturday marked the last show of this summer…so put this on your list for next year and make it happen! Secondly? Food Cart Fest! 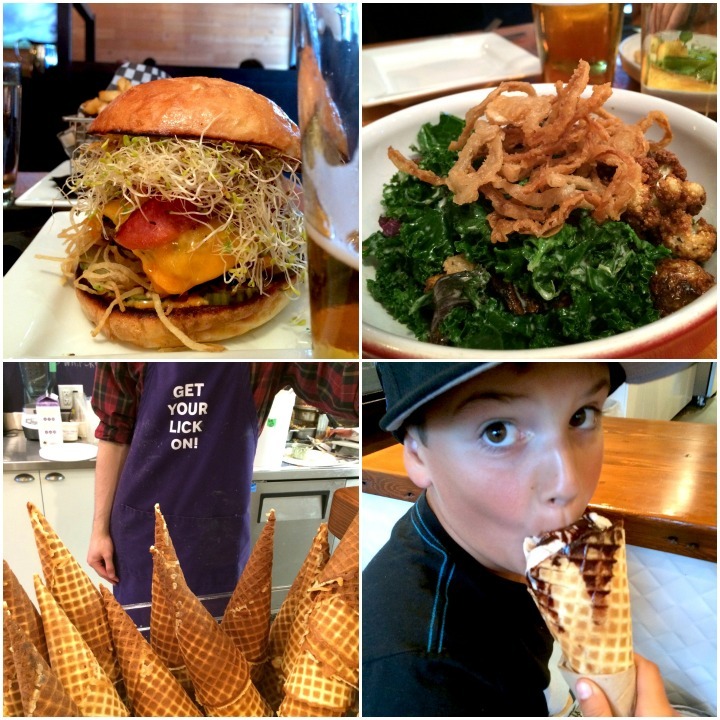 Hey, what can i say….all good things include some good food! Every Sunday this summer (check the website for specific deets), over 20 of Vancouver’s best…yummiest.. food carts assemble themselves in one location giving all the opportunity to feast themselves on some darn good eats. Quick favorites: Fish tacos from Tacofino, Cold pressed juices from the Juice Truck, Grilled Cheese with Double Smoked Bacon from Mama’s Grilled Cheese Truck, Nutella Roll from Slavic Rolls. Here’s a couple tips: 1. Free entrance is given with the your donation of non-perishable food items to Vancouver’s Food Bank. Otherwise, admission is $2…free entrance for those aged 13 and under 2. It’s a kid friendly event…ping pong tables, music, water sprayers and bounce houses will keep the little ones happy. 3. Plan for no shade…so dress accordingly. The only thing that should be melting is your ice cream sandwiches from BPP Ice Cream! 4. If Vancouver just isn’t happening for your schedule, starting Aug 9th, the Food Cart Fest will be making its grand entrance at Holland Park in Surrey for the remaining Saturdays this summer…yay!! Ok so if i’m being honest, we did more than just visit the Food Cart Fest… i feel like we kinda ate our way through the weekend! We walked to dinner at Oakwood, which consistently does not disappoint. Share plates filled the table, and while we tried dishes new to us, you cannot go wrong with the warm kale salad and the burger. I so want to replicate this salad at home…kale, cauliflower, brussels sprouts, lemon parmesan dressing…so fresh and so good! We went for a walk after dinner and well, even though we were so stuffed, who can resist ice cream? Rain or Shine had a lineup snaked out the door but that just gave our dinner a couple extra minutes to settle! Lincoln thought it was pretty cool to “get our lick on” and add chocolate sauce to his cone. They warned him it might be a bit messy…looks like he cared right?? It was a great time that we packed pretty full. Loved every moment…and especially making progress on our summer bucket list. Summer IS half over after all (sniff sniff). How are you all doing with your summer bucket lists? Got any activities marked off? What are you adamant about doing before sept rolls around?